Columbite-tantalite (Coltan) is a mineral used in the production of cell phones, laptops and many other new electronics. Most of the world’s known deposits are found in the Democratic Republic of Congo. MORE THAN FIVE MILLION (5,000,000) people have died in the Democratic Republic of Congo (DRC) since 1996, according to the International Rescue Committee. It’s estimated that 45,000 more die each month. These deaths are said to be the direct or indirect consequences of ongoing conflict waging in the country that continues to this day. An in depth look at the situation reveals the sad truth of how low humanity can sink into corruption. Eastern DRC is also home to rich deposits of diamonds, cobalt and coltan. 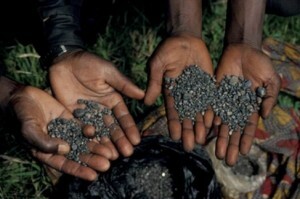 It’s estimated that 60 to 80 percent of the known deposits of coltan is found in the Congo. Even though coltan is so unknown to most people that it’s not even recognized by spell check, we rely on it as a vital component for many of our modern electronics including laptops, cell phones, video game systems and camera lenses. WSR is known as Humanity’s first ancestor. His choice to express his immortality through procreation, death and resurrection makes it possible human existence and for the cycles of life and death on Earth. IF YOU HAD the choice between living forever and dying, what would you choose? This is the choice that WSR (also known as Osiris) faced, and he chose death. Death could not be the end of WSR because he is a God, an immortal being. How can he die and still be immortal? WSR’s immortality comes in the form of reincarnation. WSR may die, but he always comes back. He is always reborn through his children. In this way, WSR is able to transcend death. WSR is our original ancestor. He is the root of the ancestral spirit, but we are different from him because we are not Divine Beings. 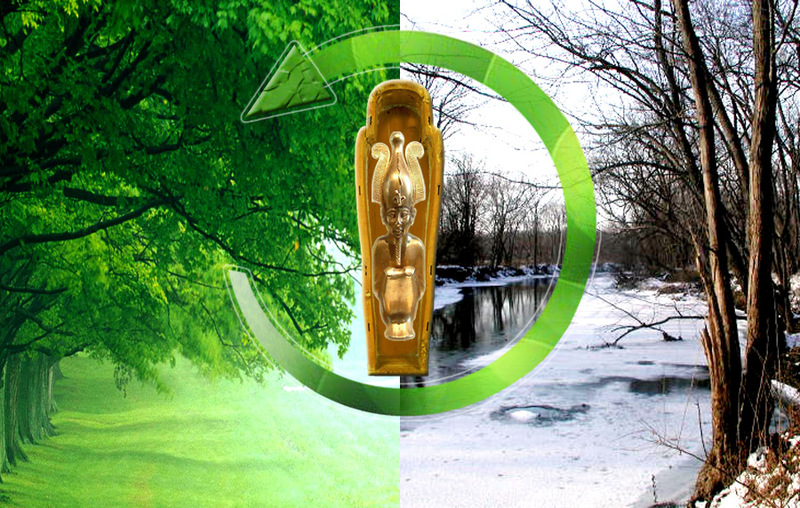 We are simply human beings, where WSR is a Divine being with certain human conditions. Unlike WSR, we have no choice about our death. We are not pure or perfect, but we do share a part of the spirit of WSR because we are his children. As the children of WSR, we must face death. We can’t run away from that fact. It is part of what makes us what we are. If being a human being means that we are born and we die, then it makes a thinking person wonder what being human really means. Death is a part of it and yet not the end of it. Everything that we seem to hold on to in life gets left behind when we die. What is left of us when everything else is taken away? In the recent past, there have been discussions between select numbers of African heads of state surrounding the idea of uniting Africa, as Europe has with the European Union for example. The proposed African Union is a concept that can be very misleading because there is no clear understanding behind the intention or the goal of such an undertaking. 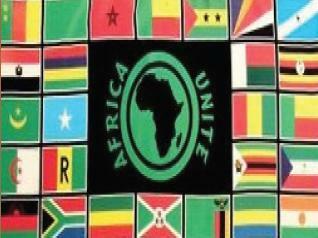 What would achieving a united Africa really mean for those living there and those of us in the Diaspora? Would it mean that Africa would control all of its natural resources and funnel the monies made from them back into its own communities? Would it mean that Africa would produce its own form of currency? Would it mean that all foreign interest would be regulated and monitored by one governing body that would ensure there will be no more civil wars based on these interests? Hypothetically? Maybe? It’s difficult to say for sure. 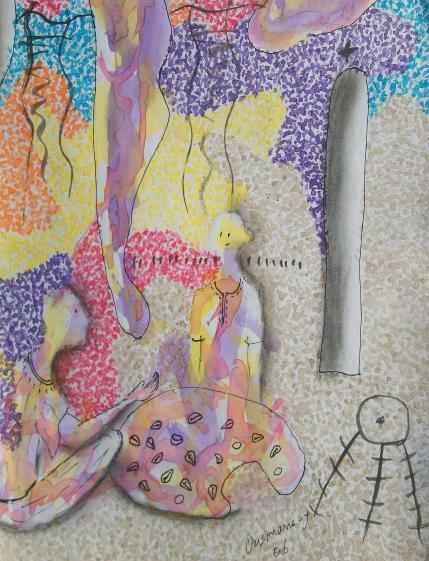 Throughout the world, there are many methods of divination or reading the energy lines of the Earth, like the reading of cowrie shells (shown in this painting by Yerbanga Bousaa Shenmira). Through these methods, human beings are able to observe details about their past, present, future, health, family and ancestors. THE STORY I’M ABOUT to tell is a story told by a wise person. So I listen with attention because I learn that in conversation we listen with the ears and not with the eyes. In most of the Kemetic countries, there’s a practice that people always go to depending on their culture and tradition, in order to live in harmony with the different components of existence and in order to resolve or prevent problems they may meet in their lives. We are talking about the practice of Earth Energy Readings that can be done in many ways, depending on the region. 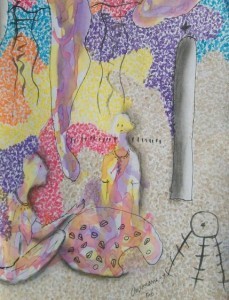 In Burkina Faso, the Mossi tribe read energy through cowrie shells. The Gourmatche tribe does readings through the Earth. The people from Poo would read energies through the calabash full of water. Through these readings, they can tell you the future, the present and the past. It teaches us that in life there is no problem without a solution. Only we are the ones that do not know where and how to find the solutions. There was a Gourmatche man who tapped (as if you were tapping into a cable) into the sand energy to do a reading. Every morning, he would do an Earth energy reading to see what was in store for the day. One morning, his reading revealed to him that he was going to die within three days. He started looking for solutions, offerings, and even sacrifices that could prevent his death. Unforunately, there were no answers or actions that could help him. What could he do? 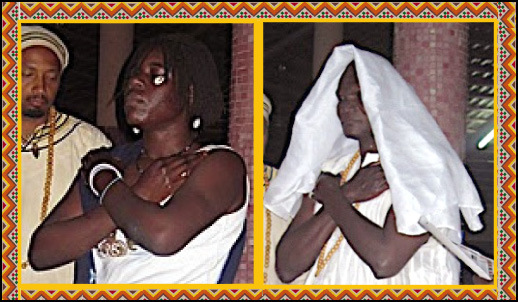 Presenting the Nemapatou Generation Merunitah (top left) and Zir (Elder) Mahaira (top right) complete the Ablutions (Spiritual Purifications) before receiving their certificates and their Kemetic names which have been given by the Earth. IN MERITA, THERE IS a proverb that says, “One should not drop their old calabash looking at the basket of another.” In other words, one should not get caught up in what belongs to another or what is coming from elsewhere to the point of abandoning that which belongs to you and that which serves you better. Our ancestors have warned us of this a long time ago. Today, in seeking the path that leads towards truth, man is exposed to a diversity of doctrines, sects, religions, etc. All of them pretending that they can help us solve our problems, improve our conditions of life, and gain better knowledge of the will of God for our enlightenment. Since colonization was born, we have been victims of this situation which is associated with government policies. Yet, humans in front of this sad reality still have this tendency of striving to achieve their goals by ignoring the unique path that is common to all, the one we know better, given to us by our ancestors. We ignore the path forged by our ancestors in order to embrace what has been imported from somewhere else. On these foreign paths, we find it hard to adapt because we are urged to only use faith or belief which doesn’t fit the reality of everyday life.